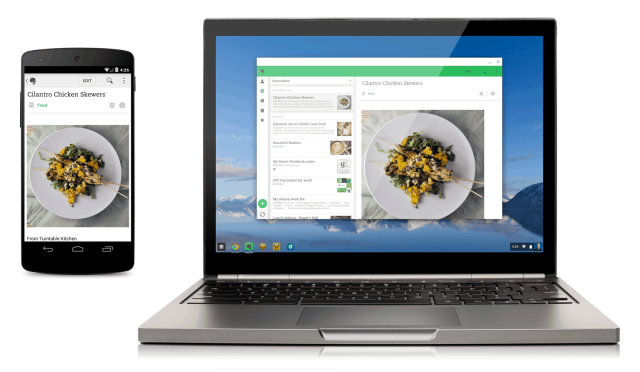 Recently Google began allowing some app to be running over to ChromeOS, initially offering four Android apps – Vine, Evernote, Duolingo and Sight Words. But the developer Vladikoff, has released a tool which will let users port APK’s over to CRX and begin running them on ChromeOS. The process uses the App Runtime for Chrome (Beta), released by Google last week, which is downloaded to compatible Chromebooks the first time you load one of the ‘official’ Android/ChromeOS apps. To get the runtime, you’ll need one of those apps installed to run any of the modified APKs. There’s a list of apps which have been tested using the tool and it’s fairly impressive, but at this stage it’s limited to loading one app at a time, with a note on the page saying that it had replaced the Vine app. Yahoo Screens, Weather and Mail work in Phone mode (might need to remove gcm from usePlayServices in manifest.json). Skype com.skype.raider – Works, requires you to enter the package name manually in the CLI, use com.skype.raider. Use an older version of APK 5.0.0.x to get this to work. XBMC – Crash after initial load. Microsoft Remote Desktop – App seems to work properly after crashing once. Once you have the App Runtime for Chrome (Beta) installed, you can begin looking at processing an existing Android app over to Chrome. Of course you’ll need the APK, but you’ll find that difficult with any app encrypted by the developer, but if you are the developer, you can go for it. You’ll also need some tools, including Node.js and the ChromeOS-APK tool, which is available on Vladikoff’s GitHub repository. There’s instructions on installing the tool using Linux commands, but this can be done on OS X, as well as Windows machines, although Windows users will have to go through a manual process for the conversion. It seems a fairly straightforward process. You’ll need to load the unpacked extension into ChromeOS from the Extensions page once you’ve converted it, but it looks like it’s fairly easy to do as shown in the video demo. If you’re interested in converting some apps over to ChromeOS and seeing how they work, head on over to the GitHub repo and check it out. Have you converted an app to ChromeOS using this tool? Which app? How did it go?